A quick post to share a presentation that I put together for the UK Marketing team for Carlsberg. An old friend of mine (Ian Hannaford @ihannaford) is now a Marketing Manager at Carlsberg and he kindly extended an invitation to talk through some thoughts on brands and marketing with the team. It was great to meet the team and I really enjoyed the session. Some really interesting ideas surfaced which provoked lots of discussion. I learnt alot about Carlsberg including the fact that it is run as a trust contributing to Danish projects and the top board is scientists and artists. How differentiated is that? I was impressed that the team was open to hearing ideas and thoughts from other marketers and categories – I wish all teams were as open. Thanks also go to the Director of Brands Paul Davies for allowing me a slot at his meeting. Do you want me come to your team meeting and provoke some thinking and discussion? Email me – I might just take you up on the offer! View more documents from Justin Basini. As ever – if you have any thoughts, disagreements, energy and passion to share about brands and marketing then please comment below or drop me an email. Update on Battle of the Big Thinking (for those that have been following my frustrations on Twitter) – I finally have a stable draft of the presentation. If you are attending see you there and if you aren’t you will be able to take part because I’m going to extend an invitation for you to join the debate! Social media has become almost a necessity when it comes to communicating with your audience, fans and customers. As more and more people turn to social media for entertainment and to follow their favourite companies, brands and celebrities it’s critical that you don’t get left behind. Not participating in social media will be like almost not having a website in the near future. Almost unthinkable! 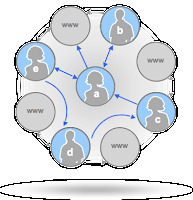 Many a SEO Company are offering to integrate your business socially, some are good and some have simply no idea. I would suggest looking at your company’s own strategy before choosing any provider should you go down this route. Social media is all about connecting and communicating with your audience, it’s not enough to create a Twitter account and then think that doing a few tweets will be enough. Your fans want to hear from you regularly, possibly once a day or more. People that are part of your network are generally interested in what you have to say or offer and want to hear more. We’re talking about real fans now, not a million pointless people who only followed you, because you followed them. By constantly keeping in touch with your audience, you create a “momentum” and a loyal following who will support you and give you valuable feedback. Should you connect with them in the right way they will become the most powerful PR machine you could ever imagine which could make your business explode with sales or enquires or implode should there be a lot of criticism. The trick to successful social media is effort in creating and maintaining your network and offering things that are of interest. Do not try to “market the hell” out of your network and fans, as all you’ll succeed in doing is losing them. Social media is an incredibly powerful tool which can help you connect with your customers and fans on a personal level, almost never before possible. This tight communication reaps huge rewards in terms of customer loyalty, brand awareness and building. Social media should be embraced to grow your business as not participating can actually do more harm than good. This article was written by Christopher Angus – An award winning Internet Marketer. You can get in touch with Christopher Angus here or read his blog here. As always – do you have a view? Do you like guest blogs? Are you creating communities of trust around your brand? Share a comment below! You can now listen to this blog as a slidecast going through the model and data. Click play below. Or you can just read the text below. View more presentations from justinbasini. There’s been a lot written recently on some of the changes which Facebook have introduced to try and stave off the threat from Twitter. We all know that Facebook tried to buy Twitter in November last year and were rejected – so we know that Facebook is interested in micro-blogging and are pushing their status updates functionality. This prompted me to think a little more deeply about the differences between Twitter and Facebook in terms of type of network built and communications employed. This leads me to believe that Twitter and Facebook (in their current forms) occupy different spaces and can co-exist quite happily. The following diagram illustrates some of the differences between the major social networks in my mind based on the intimacy, time, numbers and purpose of relationships in a person’s life. At the core of of our relationship map are deep, loving relationships with close family. Then comes our relationships with wider family and friends. After this are community relationships and relationships with our colleagues. 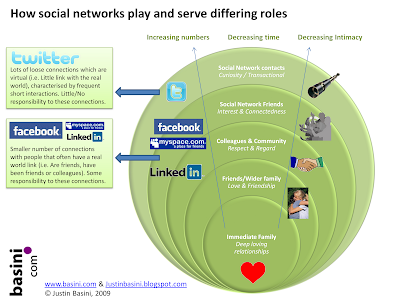 Then we get into the areas where social networks have really had a major impact: previous or infrequent friends and contacts and even people we will never meet in the real world. Facebook is perfectly positioned to fill the needs of interest and connectedness with a wider circle of friends we used to know or don’t see frequently. Of course it still has relevance for closer relationships but the new thing it adds is an unrivalled ability to stay in touch with a wider group of people that you have probably known in the real world. It’s optimised for this purpose through features such as approval of friends, having “on platform” media rich options (photos, videos etc), allowing detailed status updates. Twitter is different to Facebook because it extends the social networking phenomenon into a new territory of those that you probably don’t know or haven’t known in the real world and is optimised for fast communications. It fulfils the need of curiosity on a broader scale – following famous people, or thought leaders, or organisations is interesting and engaging. In Twitter you can follow anyone and anyone can follow you – no need for approvals. Because of this there is no real responsibility to your network of followers – as I have put it before Twitter is take it or leave it communication. Of course many of us (including me, @justinbasini!) try to share interesting updates but there is no expectation which there is more of in Facebook. LinkedIn is a good example of a vertically focused social network focused on business contacts. It bridges between work relationships past and present, together with people you want to build relationships with in the real world for business or career success. Time spent per user on Facebook is much longer than Twitter but Twitter has many more visits per month. This fits with a usage pattern that is less involved and more frequent. I also think the average number of connections is interesting. On average Facebook users have 130 friends. Social theory holds that groups of 100 to 150 are the most relationships that one individual can meaningfully hold. I suspect that this will grow as we get more comfortable with technology based contact but I don’t think this average will ever be 1000s. Now clearly at the moment the number of Twitter followers on average is low at around 20. But what I think is interesting is that if you take the top 10% of Twitter users (who we could call the early adopters and might be indicative of future usage) their number of followers on average is 483 and it is increasing fast. I think the average number of followers on Twitter could well be 1000s in the future. This definitely means it will be a different sort of network to that which one has on Facebook and potentially very exciting since you could use it to get an insight into many more different people around the world. As always PLEASE feel free to comment with your views and share with others who you think might find this blog interesting. Oh and please follow me on Twitter (@justinbasini). I am proud to say that this blog has just been selected for listing on Alltop. If you don’t know about Alltop it is a very cool blog/content aggregation tool which you can use to set up your “own magazine”. I use it alot to go through lots of blogs quickly on the subjects that interest me such as branding, marketing, banking, starting up a business and leadership. You can also do fun stuff like share your selections with friends – you can see my Alltop page here. You can find my blog under Marketing (click or search for marketing on Alltop front page) and I am the last blog (right at the bottom) – well you have to start somewhere! Hope you continue to enjoy my blogs and using Alltop. Thanks to the team at Alltop for reviewing my blog and selecting it for listing. Next challenge is to get Guy Kawasaki (@guykawasaki) to retweet one of my blogs!